McCaughey Siblings, World's First Surviving Septuplets, Born In '97, Graduate High School : The Two-Way The McCaugheys inspired awe and debate over fertility treatment when they were born more than 18 years ago. Now that they have graduated, the siblings plan to take different paths. 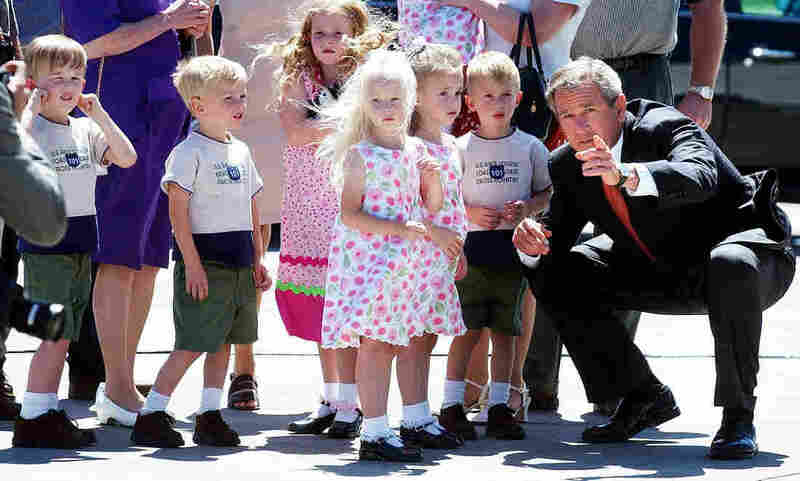 President Bush points out reporters and photographers to some of the McCaughey septuplets as they greet him at the Des Moines International Airport in Iowa in 2002. Born into the world and into the spotlight in 1997, the McCaughey septuplets have now graduated high school. Reportedly the first surviving septuplets in the world, their birth fueled a national debate about fertility treatment — and inspired awe. Alexis, Brandon, Joel, Kelsey, Kenny, Natalie and Nathan graduated Carlisle High School in Iowa on Sunday, the Des Moines Register reports. Bobbi McCaughey took a fertility drug after she and her husband had difficulty conceiving their first child, The New York Times reported in 1997. "The pregnancy has captured worldwide attention as both a symbol of the ultimate scientific miracle and a cautionary example of the unwanted consequences of fertility treatments," the Times said. The McCaugheys had been told that aborting some of the fetuses would increase the odds of survival for the others, but as the Times reported, "They said their religious beliefs would not allow any abortion." Since then, the use of fertility treatment has become much more common — and the instances of high-risk multiple births have gone down, NPR has reported. In 2012, more than 61,000 babies were conceived with the help of in-vitro fertilization clinics. That's up from fewer than 30,000 such babies born in 1998, according to data from the Centers for Disease Control and Prevention. While the McCaughey babies raised ethical concerns for some, they also attracted sizable support — including a lifetime supply of Pampers from Procter & Gamble, as CNN reported at the time. After graduation, KCCI-TV says, the siblings "will go their separate paths, including military, the work force and college." All seven siblings have been offered free admission to Hannibal-LaGrange University in Missouri; the local TV station says two of them plan to attend. A previous version of this story misspelled the name Procter as Proctor.